You are currently browsing articles tagged Medal of. Although nothing can adequately prepare one for such a circumstance, Michael Monsoor seemed to be living a life which pointed to it. He was an adventuresome boy growing up in Southern California. His father George and older brother Jim had both been proud Marines. His boyhood dream of being a SEAL began to be realized when, at 20 years of age, he joined the Navy. In the first phase of training, he broke his heel. Exhibiting the selflessness which would become his trademark, he continued to run with a pain so excruciating he nearly passed out. Unable to continue, he was forced to ring the bell indicating that a trainee had quit the program. He was medically rolled back and sent to Italy for a year where he spent the majority of his off time doing physical training. His mother, Sally, when visiting him, said he hardly ever stopped running. He then reentered a grueling SEAL program where only 23% pass, graduated at the top in the class of 2005 and was assigned to Delta Platoon. In April 2006 he was sent to Iraq on his first tour of duty. From here we almost lose our breath as we follow the rapid upward trajectory his life would take. As a heavy-weapons machine gunner, his position while patrolling the streets of Ramadi with Delta Company was right behind the point man. The responsibility for protecting the rest of the unit fell squarely on his shoulders. It was an appropriate position for a Catholic young man named after the warrior angel, Saint Michael. He was also a SEAL communicator which required him to carry a rucksack full of communications equipment in addition to his MK 48 machine gun full of ammunition. He carried the extra 100 lbs, without complaint, in temperatures as high as 130 degrees. 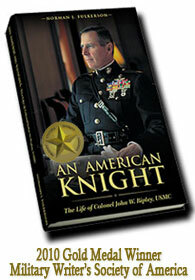 In May of 2006, during his first month in Iraq, his unit came under fire during counter-terrorist operations. Heavy enemy automatic weapons fire resulted in a wounded SEAL who was left exposed to enemy fire. Michael threw caution to the wind and ran directly into the line of fire to help the injured soldier. As gun fire chewed up the asphalt around him, Michael snatched the wounded soldier from the jaws of death with one arm, returned enemy fire with the other and then dragged him to safety. He then maintained suppressive fire while the wounded SEAL received tactical casualty treatment. After loading his wounded teammate onto an evacuation vehicle, he returned to the battle. This act of heroism earned him a Silver Star and a reputation for putting others first. As extraordinary as all of this is, it was merely a prelude to the defining moment of his life in the rooftop over-watch. When the grenade landed in front of him, Michael Monsoor knew that the length of the fuse would not allow him to toss it out. He also knew that he was two short weeks away from returning home to family and friends. Plans were already made for him to see his younger brother play in a football game for North Dakota’s Minot State University. With the only exit door at his back, a live grenade at his feet and two Navy Seals in front of him he was faced with the hardest decision of his life. It was one of those rare moments when life passes before your eyes. Having already endured so many hardships and numerous brushes with death no one would have faulted him had he chosen a path to safety. “He chose a different path,” said Mr. Winter, “a path of honor.” On numerous occasions, Michael Monsoor stared death in the face in his heroic defense of others. Once again he and death would meet and once again he put others first. 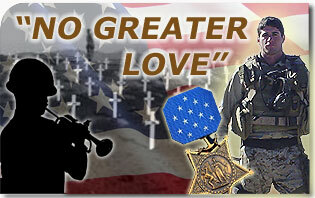 With unflinching selflessness he gave his life so that others might live. In so doing, he saved the lives of three Navy SEALS and eight Iraqi soldiers. Michael Monsoor was immediately evacuated to a battalion aid station. Fr. Paul Anthony Halladay, his platoon chaplain, was with Michael as he passed away approximately 30 minutes later. It was an appropriate end for a Catholic soldier who, according to many reports, was a practicing Catholic. His fellow soldiers told how he frequently attended mass “with devotion” before his operations. When he was posthumously awarded the Medal of Honor, a tearful President Bush reminded the audience that the day Michael Monsoor died was the feast of Saint Michael the Archangel. “When it came down to laying down his life for his friends, his faith allowed him to [do so] without a moment’s hesitation,” said Father Halladay. The most moving tribute to Petty Officer Michael Monsoor was that given by Lt. Commander John Willink during an evening ceremony at the Navy Memorial honoring the fallen hero. He described in detail a photo of Michael released shortly after his death. The picture shows Michael walking at the head of his platoon, through the war-torn streets of Ramadi. They are shrouded in a greenish yellow mist used to mask their movements from the enemy. In spite of the chaos and danger which surrounds them, Michael is calm, almost smiling. He then finishes his speech with the words he imagines Michael saying to him. They are words which I feel Michael Monsoor is saying to every American who appreciates the unbelievable sacrifice he made in a faraway land. Far from his family and the country he loved. “I am patrolling the streets of Ramadi… My eyes sting from the sweat, my gun and gear are heavy but these things do not bother me. There is no comfort here but this is the life I have chosen and there is no place I would rather be…and I am ready. “I am Michael Monsoor, I love my country, my fellow SEALS and the men fighting along side us… I have lived life to its fullest. I have not looked back. I leave nothing but love and I have no regrets.